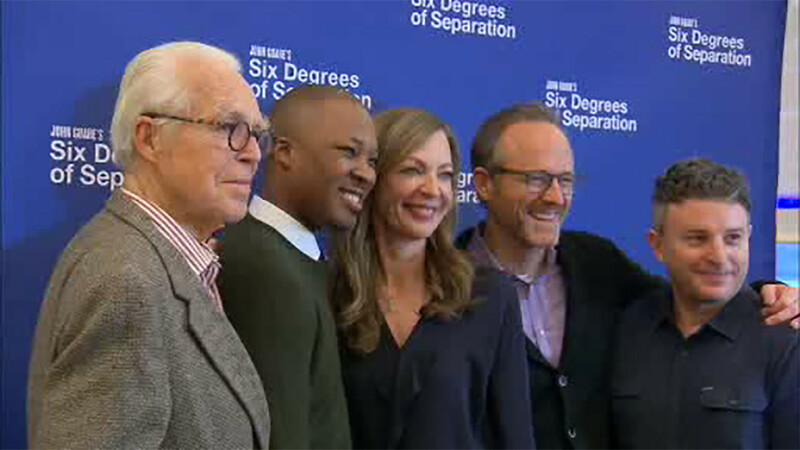 NEW YORK, New York (WABC) -- The award-winning play "Six Degrees of Separation" is returning to Broadway, starring Corey Hawkins, Allison Janney and John Benjamin Hickey. The play takes its title from the idea that as human beings, we are more alike than different. More than a quarter of a century has passed since the play first opened, and the 1993 movie proved a milestone in the career of Will Smith by showing that he could act alongside the best and brightest. Hawkins' character Paul is pretending to be the son of Sidney Poitier to endear himself to a rich Manhattan couple in the hopes of stealing their money, and the role of the wife that earned Stockard Channing as Oscar nomination is now played by Janney. "She just falls in love with his story, and it makes her feel alive in a way that she hasn't felt in a long time," Janney said. "I don't think she realized it until he comes into her life." Hawkins said it was easier to come into people's lives and fool them in an era before the internet made it so easy to check up on someone, but that this drama's universal themes are still relevant. He trained for the stage at the famed Juilliard School in Manhattan, but he found fame first playing Dr. Dre in "Straight Outta Compton." Hawkins built on the Fox series "24-Legacy" and elected to spend his hiatus from that show on Broadway. "This is an actor's dream," he said. "You know people always say it's sort of the Olympics for actors." The young man he plays is based on a real guy, and in fact, back in the 1990s, the hustler at the center of the story sued playwright John Guare for a piece of the profits. David Hampton lost the case, and he later died of AIDS. "Six Degrees of Separation" returns to Broadway at the Ethel Barrymore Theatre on April 25.